TECH TREND: Location – will anyone get it right? Location has been the next big thing for about two years. Everyone sees how huge it could be, but despite the warmest words and ambitious predictions from the tech visionaries and investment from some of the biggest names in technology, it’s still not really there. Not quite. Bright new companies Foursquare and Gowalla had a lot of attention in the tech media but tops only about 5% of the market share. And that 5% of people weren’t all regular users either, they were just the people have used location-based services. Now Facebook has piled in with Places, but uh, despite a massive build-up and big announcement, it still hasn’t really taken off (see our article Facebook Places – why the take-up is weak). The big question location services still have to answer is – why? Why update your location? Why tell people where you are? Why should we tell people where we are? Foursquare’s answer is – badges. 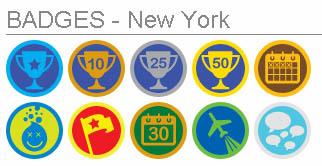 Get badges for going places, get more badges for going more places! Gowalla works on a similar principle with passport stamps. And foursquare has the competitive undercurrent of letting people become mayors of particular places (see our article on Mayor Rage). Facebook’s answer to the gaping Why? question comes in what Mark Zuckerberg said at the launch of “Facebook Places”. Something about serendipity, discovering your friends are at nearby restaurants and enabling more spontaneous social meetings is at the core of Facebook places, in theory. In practice though, it seems more about status as well.. hey check out the cool club/cafe where I am. The problem is that grown people need more than badges. Okay, clearly they like badges, but an endless stream of badges is not a motivator for ever. It parallels Foursquare and Gowalla more with games which people play for several months and then stop, rather than with social networks like Facebook which people come back to day after day for years and years. What is the point of checking into your local tescos for the 809th time. It gets sort of depressing rather than exciting after a while. For location to really work it has to be about more than badges, more than status, more than just advertising all the cool places you go to. Obviously as more people get smartphones, the number of potential users goes up, but it will still take more than that to jump-start the location market. 1) Financial incentive – yes some people get free coffees, but the incentives need to be substantially bumped up. The Starbucks/Foursquare deal has been news for a while. But we’d need to get a Foursquare pay-off in a lot more places. I want Foursquare to give me club card points, and nectar points. It needs to become the unified reward scheme for about 50 main brands and I need to get decent discounts on each of them. 2) Location really needs to get more social. Okay – I hear you, all the uses I’ve mentioned are social in some ways, but not enough. This is the territory that apps like Geomium (article here) and The Hotlist (article here) are pushing into, and yes that means seeing where your friends are in real time. Seeing not just where they are and have been, but where they’re going. Status and badges are all very well but we need more genuine interaction with location. Lets consider uses like Grindr here too… where it doesn’t matter exactly where you are, but more how near you to other people and service, using location as a kind of filter.